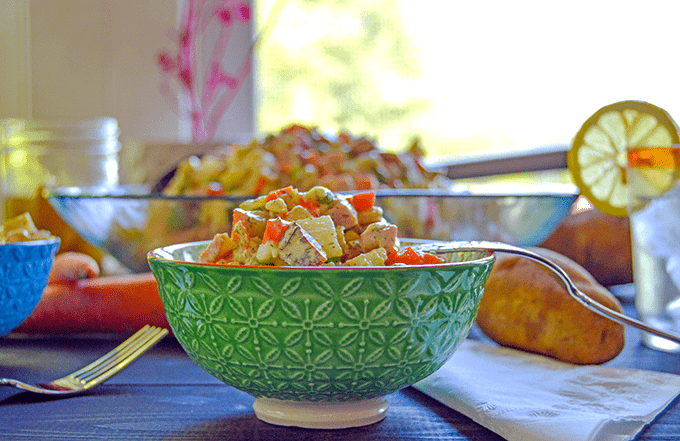 This Russian Potato Salad also known as Salat Olivye has always been one of my favorite Russian salads. 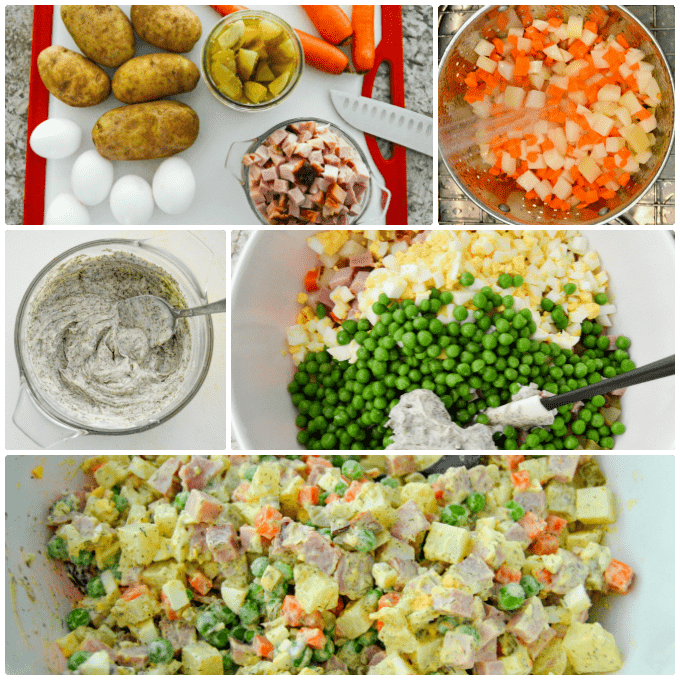 Olivier Potato Salad is a Russian-style meaty potato salad. When I traveled to Russia as a young adult I loved ordering Olivier Salad because I loved the taste and it cost no more than 50 cents. That was a great deal for me as a student and a twenty-something year old trying to save my money for excursions in a foreign country. Eating this potato salad with a side of piroshki (filled hand pies) or a bowl of borscht was a big treat for me and inexpensive. It’s a great potato salad to enjoy at a holiday feast, summer gathering or just a party side as a different type of potato salad. Olivier salad is named after a Belgian chef in Moscow who created it in the 1860’s at a restaurant called Hermitage. The original Olivier salad is nothing like the modern version. The original ingredients for Olivier salad were very expensive. 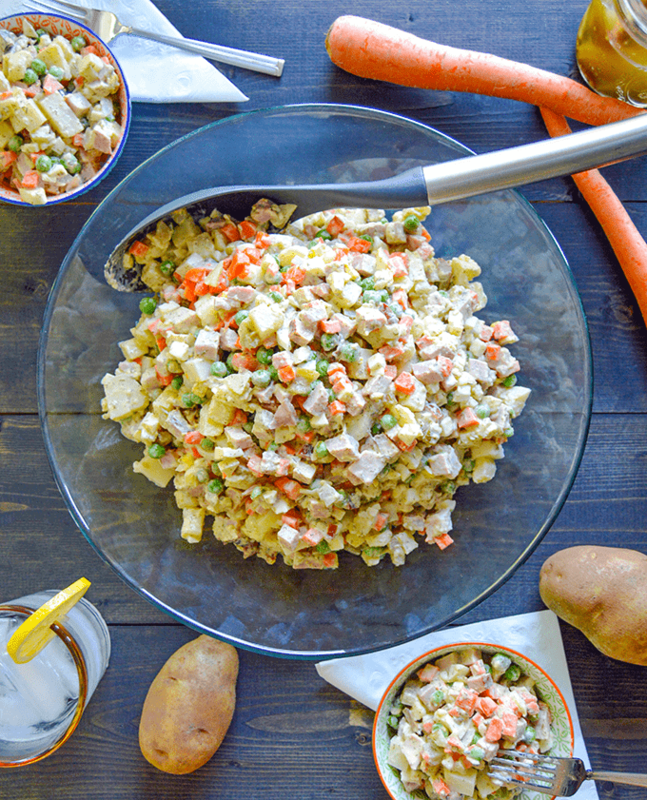 This modern version of Olivier salad came to be in the Soviet era with cheaper ingredients. Today’s version is more like the basic meat and potatoes type dish like a lot of Russian cuisine. Here’s a great little article about the salad’s history. I first enjoyed this Russian potato salad on my first overseas trip to the Soviet Union in 1991. This salad was served in many restaurants while I worked there in the 1990’s. I enjoyed all sorts of variations, some more than others, but all in all a very satisfying, filling and delicious salad. This is a creamy filling potato salad. Great for a party or celebration. *Optional- About 1/4 cup chopped green onion. I do not always add it. I base it on who I know is eating it. Place peeled and cut potatoes and carrots into a medium pot of water, covering the vegetables and boil for 12-15 minutes, till a sharp knife easily pierces the potatoes. Be careful not to overcook, you don't want the potatoes to fall apart. While the vegetables are cooking, start hard boiling your eggs and chopping the rest of the ingredients if you haven't yet. After the potatoes and carrots are done, immediately drain them into a colander and rinse them with the coldest water until it's well cooled to stop the cooking. In a large mixing bowl start adding your ham, pickles, peas and eggs. Once the potatoes and carrots are cool and well drained you may add them to the large mixing bowl as well. In a small bowl add your mayonnaise, chopped dill, salt and pepper and stir till well combined. Scrape every bit of your mayonnaise mixture into your large mixing bowl and gently stir all of the ingredients just until well combined. Chill the potato salad in the refrigerator for at least 1 hour and then enjoy! To refresh the salad before serving I like to drizzle a little olive oil on the salad and stir. It just livens it up and refreshes the salad. Also check to make sure it's salted enough and adjust if need be.